CAS credentials are highly respected and provide our members with opportunities for advancement and growth throughout their actuarial careers. Located all over the United States, Canada, and around the world, CAS members are employed by a variety of companies and organizations. With 8,342 members and growing, the CAS is represented by members who are located across the globe. 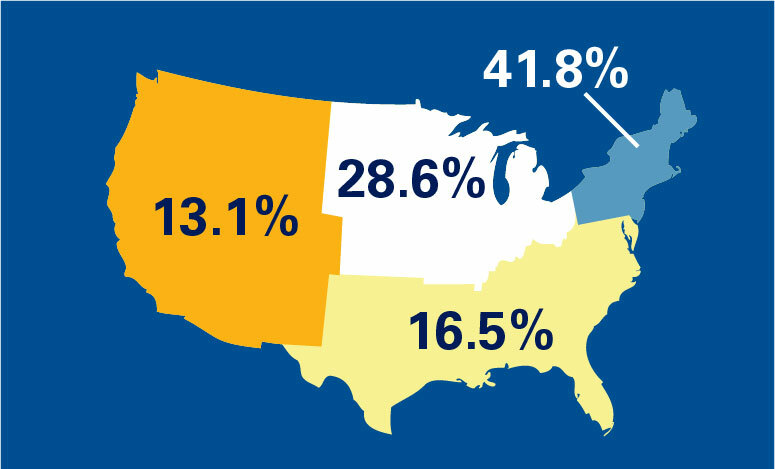 Approximately 83% of CAS members live in the United States and 11% live in Canada. The remaining 6% are distributed across the rest of the world. The CAS is proud to be represented by members from every region of the world. Outside of the United States and Canada, you will find the greatest numbers of members living in Asia, the Caribbean, or Europe. Approximately 6,909 CAS members are located in the United States, with the majority living in the Northeast and Midwest, where many large insurance companies are headquartered. However, the number of members who live in the Southern and Western regions of the United States is steadily growing. 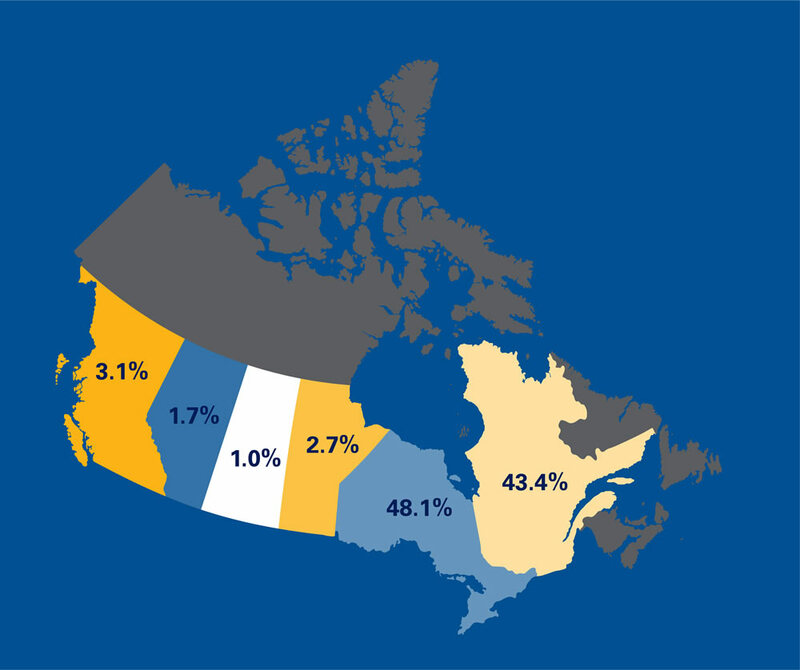 Canadians make up about 11% of the CAS member population, with about 895 members. The greatest number of Canadian members live in the provinces of Ontario and Quebec. In fact, more CAS members live in Ontario or Quebec than live in Ohio or Texas. From property & casualty insurance companies, to consulting firms, and even government agencies, CAS members work for many different types of organizations. Property & casualty insurance companies provide protection against first-party damage or loss on things that are owned (property) as well as third-party injury or damage (casualty). Property & casualty insurance is categorized together because insurance companies are licensed to write and package policies that cover both categories. Consultants can be employed by national firms or in small practices. They are contracted to work with outside companies on a project-by-project basis and are billed on an hourly basis. Consulting work often requires travel and provides a variety in daily work and responsibilities. Companies that sell reinsurance specialize in the sale of insurance to insurance companies. Reinsurance is a transaction in which a ceding company pays a reinsurer a premium for protection against the loss or losses that the ceding company may sustain under the policies that it has issued. Reinsurance is purchased by the ceding company as a means of stability, increasing company capacity, and protection against catastrophe. Organizations that serve the insurance business offer a variety of services. These businesses may provide insurance rate and loss recommendations, statistical and actuarial services, analysis of industry trends, underwriting policy language, along with other resources. Companies that act as insurance brokers or agents are the middlemen in the transaction of insurance sales, between the insurance company and the company/individual who is purchasing the insurance. Brokers and agents have the ability to sell products from a variety of insurance companies. Life, health, and accident insurance companies sell coverage that provides for the payments of benefits as a result of death, sickness, or injury. Each of these three industries provides a specific type of protection to the insured. Federal, state, and local governments have a wide range of responsibilities and often establish various departments or agencies that are responsible for the management and administration of specific functions. CAS members are employed by many different governmental organizations that oversee public programs or ensure compliance with regulatory laws. Academic organizations include institutions of higher education as well as groups that work to advance a specific discipline through research and scholarly publications. Well over 1,000 different companies employ members of the CAS. The table below lists the companies that employ the largest percentages of CAS members.